One of the most important things for conservation practitioners to be able to do is to detect real improvement (or real declines) from otherwise random changes for a species or ecosystem (Black and Copsey 2013). 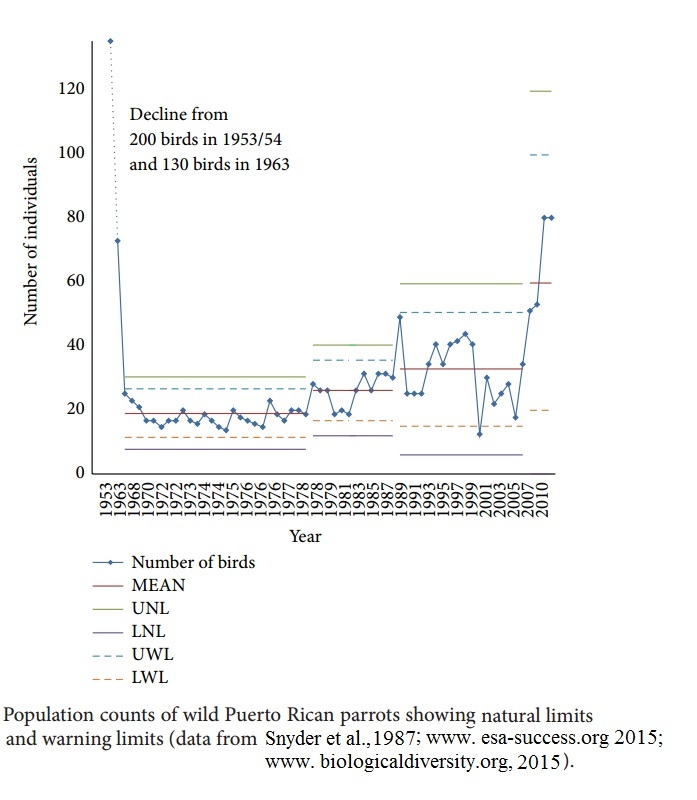 If we take the example of the recovery of Puerto Rican Parrots, initially managed by Snyder et al (1987) in the 1970s and 1980s, we see phases of the parrot population going up and down over time, some points above a mean line and some below (as you would expect). Where the pattern of data falls outside this expectation, the system has fundamentally changed. In the case of the Puerto Rican parrots, this occurred in 1978 and again more fundamentally in 1989. It even looks like a new breakthrough may follow on from 2009. Even more important than the actual numbers however, is the insight from plotting natural limits and warning limits. For the parrots we see that although the population is generally improved it is not stable and could be expected throughout the 2000s to drop to less than 10 birds as much as rise to 65. Indeed today’s population could yet be vulnerable to extinction – with a projected lower natural limit appearing to be below zero using most recent year’s data . Snyder,N. F. R. , Wiley, J. W. and Kepler, C. B. (1987) The Parrots of Luquillo: Natural History and Conservation of the Puerto Rican Parrot,Western Foundation of Vertebrate Zoology, Los Angeles, Calif, USA. 110 Success Stories for Endangered Species Day 2012: Puerto Rican parrot (Amazona vittata), March 2015, http://www.esasuccess.org/caribbean.shtml. Endangered Species Act Works: Puerto Rican parrot Amazona vittata, 2015, http://www.biologicaldiversity.org/campaigns/esa works/caribbean.html.